Nong Nooch Tropical Garden is nursing back to health a baby elephant abandoned in the wild by its mother. Park Director Kampol Tansajja has his Nong Nooch Tropical Garden nursing back to health a baby elephant abandoned in the wild by its mother. 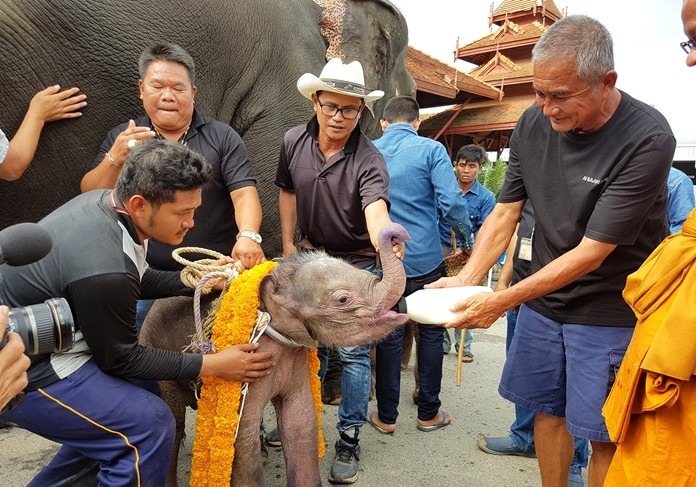 Park Director Kampol Tansajja said the Najomtien elephant park recently took in 3-month-old Fa Jaem after it was seen wandering alone on Khao Anglanai in Chachoengsao Oct. 19. 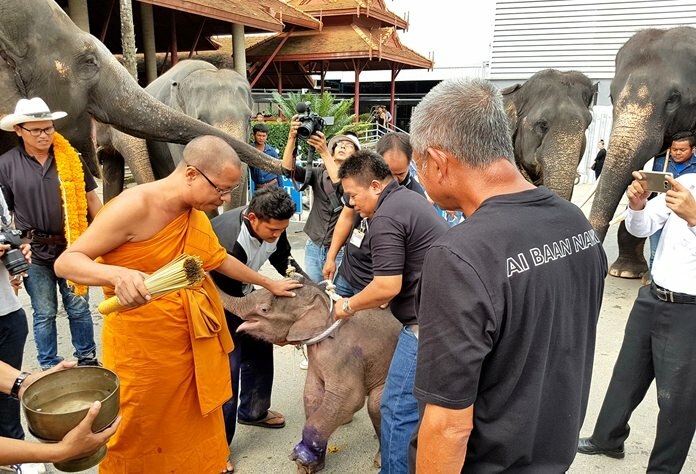 It finally was captured by residents of Chan­thaburi, but not before the baby pachyderm’s legs were injured by a trap. The animal was taken to a veterinarian in Chachoengsao, but doctors transferred Fa Jaem to Nong Nooch for better care. It was welcomed and named at a ceremony Oct. 25. Kampol said the female juvenile will be under the care of vet Padej Siridamrong and is being suckled by two cows who recently had miscarriages. He said the young elephant’s condition was stable and is slow adapting to the environment. Elephant tamers stated it will take about another three months before any wild animal will accept care and get used other animals in captivity. However, they said, the new arrival seems to be healthy and strong.